When launched, the server starts a series of file transfer services, using various file transfer protocols. It also starts the internal services used by all file transfer services; for example, the authentication service and the log service. All services are executed under a single server process. This page describes general server configuration options and options affecting all file transfer services. You can access the section via the ‘Server’ page in Local Manager. For text configuration, options affecting all services are grouped inside the server section. Alphanumeric and dash (‘-‘) character. No space characters. 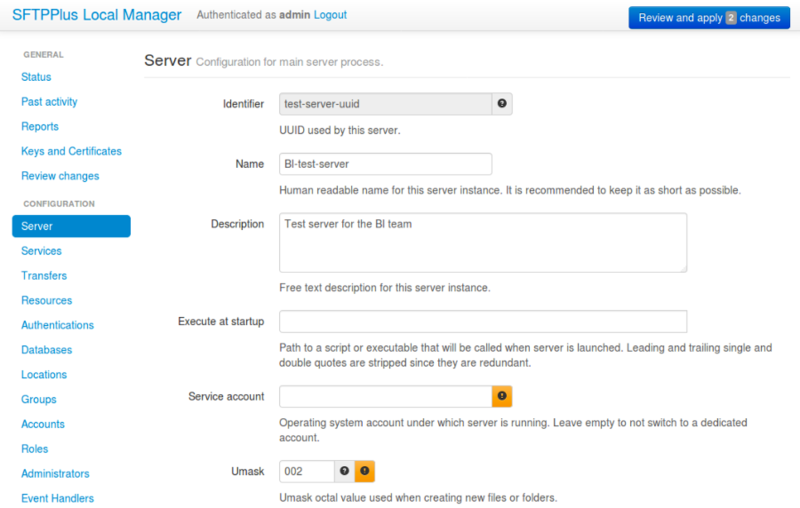 The universally unique identifier (UUID) allows the server to be identified when multiple servers are active in the same deployment. It can be any unique string, but we recommend using the UUID standard format. When aggregating audit entries (logs) or authentication requests from multiple servers, the UUID is used to identify the source server. UUIDs are intended to be used for low-level server implementations. For a human-readable name, please use the name attribute. Once a UUID is defined, it is not recommended to change it. To generate a UUID value, please check the dedicated documentation for admin-commands generate-uuid. For more details, please check Wikipedia’s article on UUID. Human-readable name for this server. This may be a fully qualified domain name (FQDN). This is a human-readable companion for the UUID. As long as the UUID is not changed, you can change the name at any time, and the server will still be recognized in a multiple deployment architecture. Free form text describing this server. This can be used for any free form text attached to this server. It can include contact information about the system administrator, comments or other details specific to the installation. A user under which the server will operate. Disabled - if the server should use the same user as the one used to launch the server process. This is a system account used by the server to run its main operations with restricted privileges on Unix systems. To disable running the server under a dedicated account, set this value to Disabled . This option is ignored on Windows systems, where the server will operate under the same account as the one used for starting the server. Path to an external script or executable which will be called at server’s start. Disabled - no command will be executed. Specifies the external executable or script to be executed just after the server starts. Set it to Disabled not to run any command. The command will be executed under the account launching the server and not under the account defined by the ‘account’ option. User mask in octal format. User mask file permissions used for creating new files and folders on the server. When creating new files, the server will use the 0666 mode, masked with the value of umask. When creating new folders, the server will use the 0777 mode, masked with the value of umask. This option is ignored on Windows systems. Comma-separated list of UUIDs with global authentication methods enabled on this server. The list should be ordered by priority. The server will try to use the first authentication from the list, and continue with the next method if the user is not accepted. When a service defines its own authentication list, the global list is ignored. Comma-separated list of UUIDs with authentication methods to be used for authenticating the administrators for the Local Manager service. This defines the minimum strength element of the password policy applied when setting passwords through Local Manager. This does not enforce the policy for already defined passwords or for passwords defined outside of SFTPPlus, such as OS passwords. The available values are from 0 to 4 where 0 is a weak password while 4 is a password which is considered strong. 0 - no length limit. This defines the minimum length element of the password policy applied when setting passwords through Local Manager. Set it to 0 to disable password length checking.